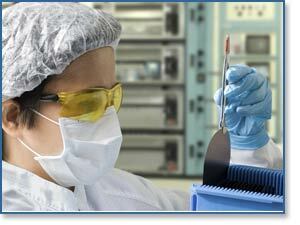 Raman spectroscopy is an established technique for the characterization of semiconductors. The band positions in the measured spectrum contain information on the material composition, structure, and mechanical forces. The peak intensity and half-width also yields valuable information. The coupling of the Raman measurement to a microscope allows observation of local strain, and for investigation of small scale microelectronic devices (micron scale). Failure or defect analysis is another important area of Raman microscopy. The ability to analyze even micron size particulate in situ can provide the engineer information on contaminants and potential contamination sources. During manufacturing non-contact Raman spectroscopy can be used as an indicator of temperature, a variable that can affect crystal growth. In situ analysis of processing baths is also possible using Raman. The ability to analyze and predict the concentration of materials in these baths can allow for faster processing time, reduce waste due to etching, and minimize waste by allowing baths to be charged only when required and maintaining "in-spec" product output.